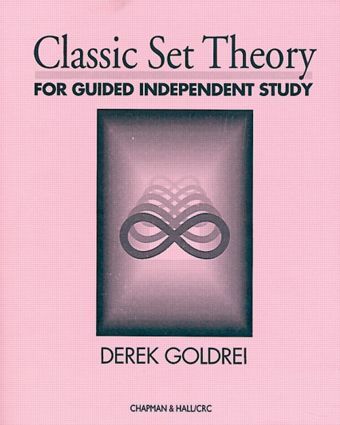 Designed for undergraduate students of set theory, Classic Set Theory presents a modern perspective of the classic work of Georg Cantor and Richard Dedekin and their immediate successors. This includes:The definition of the real numbers in terms of rational numbers and ultimately in terms of natural numbersDefining natural numbers in terms of setsThe potential paradoxes in set theoryThe Zermelo-Fraenkel axioms for set theoryThe axiom of choiceThe arithmetic of ordered setsCantor's two sorts of transfinite number - cardinals and ordinals - and the arithmetic of these.The book is designed for students studying on their own, without access to lecturers and other reading, along the lines of the internationally renowned courses produced by the Open University. There are thus a large number of exercises within the main body of the text designed to help students engage with the subject, many of which have full teaching solutions. In addition, there are a number of exercises without answers so students studying under the guidance of a tutor may be assessed.Classic Set Theory gives students sufficient grounding in a rigorous approach to the revolutionary results of set theory as well as pleasure in being able to tackle significant problems that arise from the theory.